Get one percent better every day. The Carmel High School boys’ varsity basketball team walks into practice every day with this mindset. An underdog entering the most competitive division in the Pacific Coast Athletic League, the Gabilan Division, this team faces new challenges as they attempt to exceed last year’s accomplishments. The team is standing with a league record of 4-1 heading into Tuesday’s game at Alisal and a season record of 15-4. In 2017-18, the CHS basketball team won the Mission Trail Athletic League Championship and finished their season in the third round of the Central Coast Section, only losing one starting senior and three others for this year’s season. The team consists of a group of high-energy, talented young men with a passion for the game. Sophomore JT Byrne, named 2017-18 All League MTAL MVP, has led the team this season as a scoring leader with an average points per game of 20.54 and total points of 267 leading into Tuesday’s game against Alisal. He has led in free throws with an average of 3.85 free throws per game, and has also led the team in field goals. Following Byrne in scoring as a whole is junior shooting guard Kai Lee with a total of 195 points and averaging 15.00 points per game through Jan. 28. Each player brings a different aspect to the Padres, bringing energy and drive to each game, making themselves tough competition. Both coaches and players recognize that their bond grows tighter, and their ability to play cohesively expands through the significant leadership on the team. “Zach DeZee and Joe Garello uphold standards that all of the younger players are expected to meet every day,” says junior Ethan Fletcher of the two senior leaders. Carmel won against Monte Vista Christian, finishing with a huge lead of 70-17 on Jan. 25 and beat Salinas 82-72 on Jan. 23. After losing their first game of league play to Monterey 58-63 on Jan. 18, the boys bounced back with a 69-51 win against Palma on Jan. 21, ending a 20-year losing streak against the Chieftains. On Jan. 11, the team kicked off league play with a road victory of 69-61 against Alisal High School, a Gabilan League Champion who had not lost at their home since 2015. The Carmel players are constantly striving to improve and push each other in regards to their individual roles. Players who are not starting or playing many minutes remain supportive in order to reach the team’s goals. 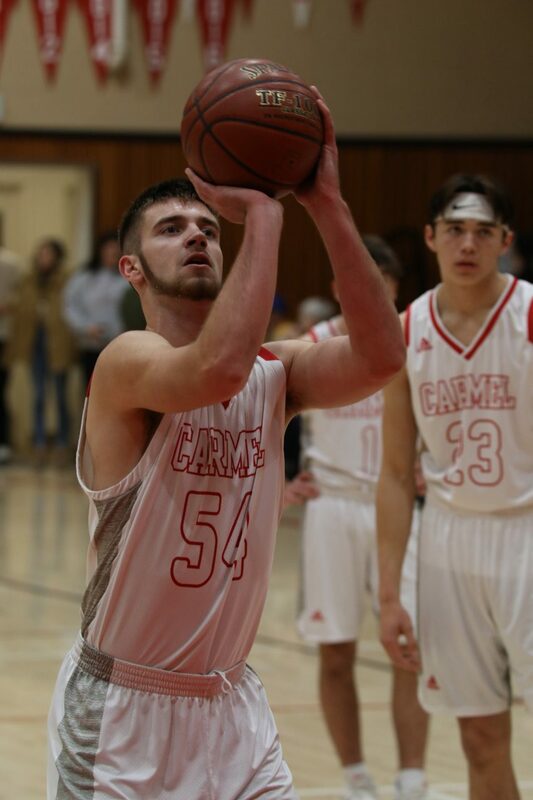 This past week, Carmel was scheduled to face Alisal at home Tuesday and Palma on the road Thursday before a rematch with Monterey in the CHS gym at 7 p.m. Tuesday, Feb. 5.